The support for the emergency Spencer ventilator grants complete autonomy for the ventilator. Indispensable for transportation. Spencer Kompak 170 is composed of an epoxy powder varnished aluminium panel and a protective lining made of washable nylon. The cover is divided into sections to allow easy access to the internal apparatus. There are also some internal pockets for accessories. The protective cover has a strap closure. The handle on the upper side allows an easy grip. It contains a 2 L oxygen cylinder, complete with pressure regulator fixed by wall hooks for safe positioning and easy replacement. 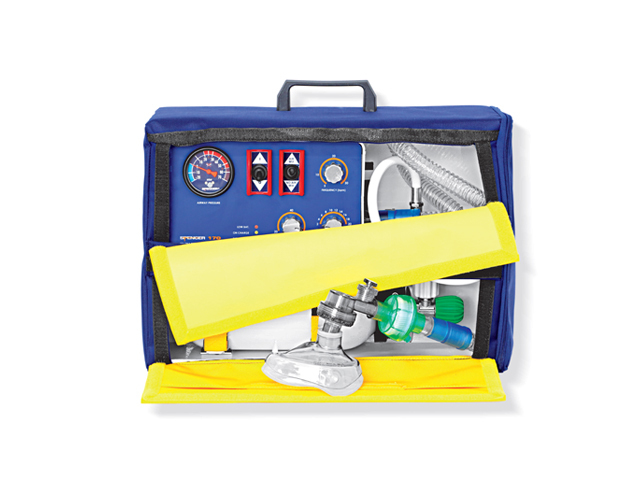 It is supplied with all the joints needed for the connection of the ventilator to the oxygen supply of a centralised system.